Our beautiful home is located on a quiet side street, blocks from the Gulf of Mexico, and has many special features. 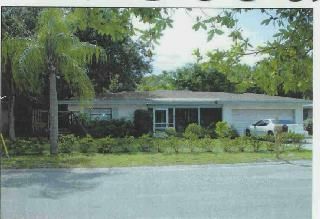 Parquet flooring in main living area, tile throughout rest of home, lovely Florida room overlooking pool area, garden windows (bathroom and kitchen), 2 remodeled bathrooms (one with Jacuzzi tub), new kitchen with all new Whirlpool appliances, dishwasher, microwave, tiled countertops. Master bedroom has King sized bed.Front and back screened porches. Double Driveway. Attractive fenced very private back garden area with 15' x 30' pool and fish pond. Walk 3 blocks to Pinellas Trail and Hammock Park. A six 6 block stroll down San Salvador Drive brings you to the Gulf with a beautiful view of the famous Caledesi Island Nature Preserve. Only minutes to Clearwater Beach and Honeymoon Island! Tampa and St. Pete are both about a 35 min. ride. Several golf courses nearby. Dunedin Fine Arts Center and brand new Dunedin Community Center, including health club, are nearby. 2 hours to Orlando. Master bath w/shower; 2nd bath w/jacuzi. Incoming calls accepted from everywhere; only local outgoing calls allowed. Cable internet service. Attractively furnished home, pool, Central air, cable TV, Dishwasher, Microwave, Toaster, coffeemaker, Jacuzzi bathtub in 2nd bathroom! King sized bed in Master bedroom with king size bed. Second bedroom has two twin beds. Outdoor furniture, barbeque grill. Washer & Dryer. No smoking inside house please! Well-equipped, well-maintained and comfortable house in a great location. Quiet neighbourhood, walking distance to Pinellas Trail, Hammock Park, "downtown" Dunedin, and an easy drive to Honeymoon Beach State Park, Clearwater and St.Petersburg. On rainy days we enjoyed sitting out in the screened-in porch (lanai) reading books from the selection available in the house. Paul was very kind and helpful, especially when we had a health scare at the end of our stay. Thanks Paul. Hope to be back next winter. The house was perfect for us. We brought our two miniature schnauzers and we all fell in love with the house, its location and the town and people of Dunedin. The house is a few blocks from the beautiful Pinellas walking trail which we utilized every morning. Paul and Lois were great - very informative and always available to answer any questions we had. The house was very clean and extremely comfortable. Beware of the recliners in the living room.....we fell asleep in them almost every night because they were so comfortable. We definitely recommend this rental and and hope to vacation here again next year. We rented this lovely home for a month and were delighted. Very spacious and comfortable. Having a backyard pool to relax by in the heat of the day when it was too hot for the beach was fantastic. The owners are very accommodating and accessible and solved a minor problem immediately. Dunedin has many dog friendly pubs and restaurants and our Pekinese and Shih Tzu loved going out with us. Our favorites were The Brown Boxer in Clearwater Beach and JolliMon's Grille in Dunedin. We recommend this home for anyone with pets looking for a relaxing holiday they can enjoy with them. Perfect place for a peaceful getaway but within walking distance to trails, parks and wonderful downtown Dunedin. The house was just the right size for 3 -4 people with an excellent kitchen and great pool and backyard. This was our first vacation rental and the owner was very helpful. shops. Or rent a bike and go to the beach! home of the Toronto Blue Jays, with Yankees & Phillies close by. Single week rate is $750/wk. Monthly rates vary by season as follows: Jan:$2500; Feb 2900; March $3800; April $2300/month. For Feb & March there is a one month minimum rental. May to December monthly rate is $2000. 13% tax, cleaning fee, pet fee & security deposit extra. All utilities included. Security deposit of $500 will be refunded within 15 days if no claims are made. $85 cleaning fee; $100 non-refundable pet fee. Tax is increasing to 13% as of January 1, 2016.